You will be wasting your time with that type of hub puller for the rear units, I regret to say. The suggestion pitched by Chris is spot-on and I had to do exactly that - took it to an independent Jag dealer who was more than happy to assist; perked his day up by dealing with a real bit of engineering. He used a state-of-the-art Jag puller, it still took some force but they did pop eventually. Bottom line is that I would never have got the hubs off on my own - I would still be there now. Charged me £50 but it would have been cheap double that price !!! You could try this but to be honest is it really worth the chance, probably no. With the axle dropped, it does give you additional opportunities to carry out other repairs etc that might be hampered with the axle in situ. Lets face it, you are half-way there for removing it. So , can the Church Hill tool JD1, be hired, or bought from anywhere, does the DLOC have one ??? Tried many pullers without succes. I have cut the nuts at the rear and pulled out the hub and the half shaft. Then it was easy to use a 20 T hydraulic press. A friend once told me that when he needed to remove the hubs from his Majestic Major a local garage told him to undo the hub nuts half a turn and then go for a drive on a twisty road. About five miles later there was a loud bang followed by a second. Both hubs had come free. A steady drive home soon had the job finished. Obviously not a job for the faint hearted and to be done with extreme caution but didn't require removing the axle and a big press. Hi guitarman No this 10 tons hydraulic puller blown with no effect on the hub. And yes the half shaft comes easily after cutting the nuts. 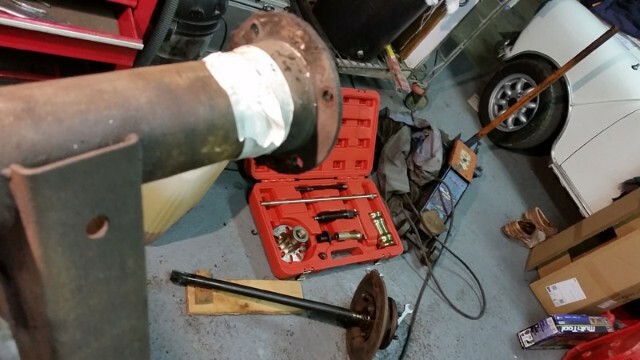 I have a five leg hydraulic puller which worked well.It bolts onto the wheel studs. It cost £70 from eBay but I would sell it for £50 plus carriage. The three legged screw puller pictured above has no chance at all - you need a hydraulic one. The big thing is DO NOT HIT THE PULLER NUT WITH A BIG HAMMER. All you will do is wreck the hub bearings, the diff or the axle casing. Wind up the puller as tight as you can and apply plenty of heat to the hub. Use a hammer and tap round the ring that holds the wheel studs, keep spinning the hub and hitting the ring continually tightening the puller if possible as you go. The puller on its own will probably not remove the hub but with the hammer taps it will. The hammer strikes must be towards the centre of the ring and if possible use two opposing hammers at the same time - like you would do removing a track rod end. Hi , I had to remove my axle and take to an engineering company and they had two blokes working on it who took three hours and it finally released the hubs a 40 yes 40 tons pressure on the one side and slightly less on the other, I had the axle rebuilt by Central Axles of Birmingham and they recon I had done the hardest part of the rebuild, they use mult-leg pullers and load the puller,heat the hub with localized heat reload the pressure on the puller, loads of rust penetrant leave loaded for a few days,repeat the process again and again and still it can take a few weeks. yep it's a b****r of a job.